Heat oven to 425°F. Unroll 1 pie crust on work surface, and sprinkle with almonds to within 1 inch from edge of pastry. Using rolling pin, lightly roll almonds into pie crust. 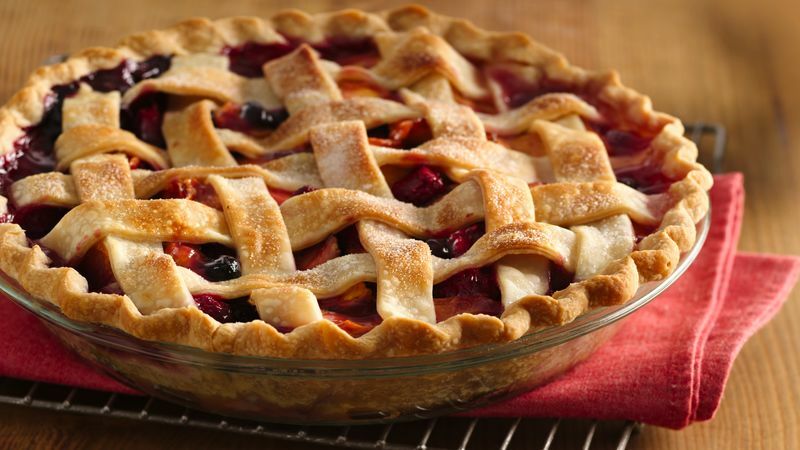 Place pie crust in ungreased 9-inch glass pie plate. Press crust firmly against side and bottom. In large bowl, mix brown sugar, granulated sugar, cornstarch, salt, orange extract and vanilla. Stir in peaches, raspberries and blueberries until evenly coated. Spoon into crust-lined pie plate. Dot surface with butter. To make lattice-top crust, unroll second pie crust on work surface, and cut into 3/4-inch strips. Place 5 strips pie crust across filling in pie plate. Weave a cross-strip through center by first folding back every other strip going the other way. Continue weaving until lattice is complete, folding back alternate strips before adding each cross-strip. Trim, seal and flute edges. Brush lattice top with milk and sprinkle with sugar. Bake pie on cookie sheet on bottom shelf of oven 15 minutes. Cover edges with foil. Bake 25 to 30 minutes or until filling bubbles. Cool on cooling rack until juices thicken, about 3 hours. Toast sliced almonds uncovered on ungreased small cookie sheet in 350°F oven 6 minutes. Orange extract and vanilla can be replaced with Fiori di Sicilia, which is found at specialty grocery stores. To save time making lattice-top crust, do not weave strips. Simply place second half of strips across first strips.